Among the top independent operators and developers of wind farms in India based on aggregate installed capacity - the wind energy business from Orient Green Power focuses on the development and operation of wind farms in India, Europe and South Asia. The flow of wind and wind speeds has an important bearing on generation capacity. Orient Green Power has years of experience in determining the best location and putting up wind turbines for maximum efficiency. Even the design of our wind turbines is optimized to get the best out of low wind speeds at varying points during the year. With a total nearly 424.63 MW wind, our wind farms are located in the states of Tamil Nadu and Andhra Pradesh, which are among the top four Indian states with the highest wind potential and which have favorable incentives for renewable energy companies. 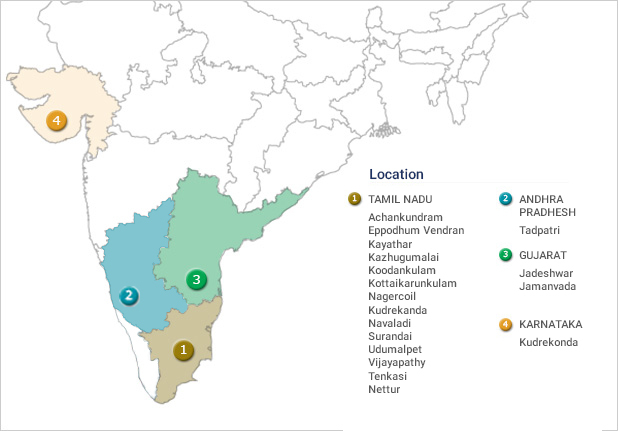 The presence in Tamil Nadu is being expanded along with other locations in Andhra Pradesh, Gujarat, Karnataka and Maharashtra. In the International market, we have 10.5mw installation in Croatia.